Black Forest Crust sounds like a romantic bread and it is. The romance of a German vacation is waiting for you with this moist wheat and rye "Mischbrot." A sourdough and sponge are set up in a few minutes the evening before and this tasty bread is baked on a hot stone in a conventional oven, giving it a thick, chewy crust that tastes good with all sorts of toppings. 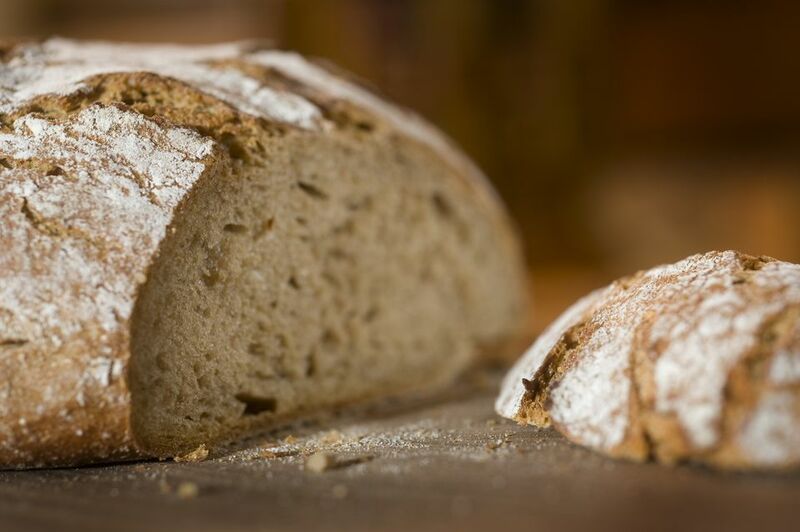 The rye flour called for in the original recipe is "Roggenmehl 997", which falls between light and medium rye flours. Substitute all light flour or all medium flour if you wish. The bread flour used in Germany, "Weizenmehl 812, " closely resembles King Arthur French Style or European-Style flour. If this is too expensive or unavailable, bread flour which has a high protein content as well is also good. This takes only a few minutes and becomes quicker, the more you do it. If you are baking bread a lot, invest in a scale so you can use the very accurate measurements by weight. Mix the ingredients for the sourdough starter together by hand until it forms a ball. Cover the starter and leave at room temperature for 12 to 18 hours. The starter can be fed on rye or white flour. The starter should have been recently fed, so if it has been in the refrigerator for a month, feed it once before starting this recipe. Mix the ingredients for the sponge together by hand. If you are using fresh yeast or non-instant yeast, dissolve the yeast in a little of the water before you add it. When the dough comes together to form a ball, let it sit for two hours at room temperature. Then wrap dough in plastic wrap and place in the refrigerator for 10 to 16 hours. You can also refrigerate both parts for up to 48 more hours if necessary. Mix the sourdough, sponge and the rest of the ingredients in the mixer on low with a dough hook for about eight minutes. Turn the speed up a notch and continue mixing for four minutes. Turn out onto a lightly floured board and knead a few times. Add flour if the dough is too soft. It should be supple, but not so soft that it loses shape immediately on the board when you let it go. Let it rise, covered, for 30 minutes. Punch it down and then let it rise for 15 minutes. This assumes a dough temperature of about 74 F. If your dough is colder, let it rise a bit longer. The dough will NOT double in bulk. Form two round loaves with the dough, pulling the dough around to form a "boule" and stretching the gluten "skin" around towards the bottom. Do not completely pinch the underside closed, as that will be the attractive top in the oven. Place the round of dough with the seam-side down in a rye-floured bread basket or flour-lined bowl. Let the bread rise for 60 minutes. You should see an appreciable rise, even if not doubled in bulk. Heat the oven with the bread stone for at least 30, better 60 minutes, to 475 F. The stone should be on the middle rack with a rack underneath it to hold the hot water pan. Unmold the bread (seam-side up) onto a cornmeal-strewn baker's peel or the back of a cookie sheet and transfer to the hot stone. After two minutes, open the oven door and add a cup of hot water to the hot water pan. Add steam by spraying the walls with water, if you can. After 10 minutes, turn oven temperature down to 400 F.
Bake for 40 more minutes. Open oven a crack for the last 20 minutes to let out the rest of the steam. Bread should have an internal temperature of at least 190°F. Allow the bread to cool completely before slicing or freezing. This bread can be enhanced with caraway seed (about 1 teaspoon) or "Brotgewürz," a mixture of caraway, anise, fennel and coriander seeds, crushed.